German firm BASF’s new 30% glass fibre-reinforced PA6.10 has found a production application by French fastener supplier ARaymond while Rhodia Engineering Plastics has developed a higher heat resistant grade. 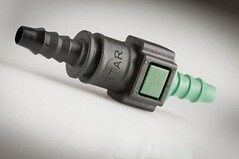 BASF first introduced the Ultramid S3WG6 Balance at the K2010 for quick connectors for fuel lines. The material is characterised by its hydrolysis and fuel resistance. The mechanical properties after storage for over 2,000 hours at elevated temperatures in biofuels such as E 24, B30, or B100, for instance, are at a level comparable to those of PA12 GF30. The material also passes the typical automotive tests for environmental stress cracking resistance in the presence of zinc chloride (SAE 2644, FMVSS 106). As a consequence, the material is able to replace PA12 in applications where this is required. Quick connectors of this kind are used by almost all major global automotive and truck manufacturers. In view of the high demand for P 12 substitutes, BASF is now enlarging its PA 6.10 portfolio together with customers. Solvay-owned Rhodia Engineering Plastics’s heat-performance Technyl PA range is designed specifically for injection and blow moulded parts in turbo-charged engines. The PA 6, 6 grades allow engine parts to resist temperatures of up to 210°C, higher than previous grades that were resistant up to 200°C.